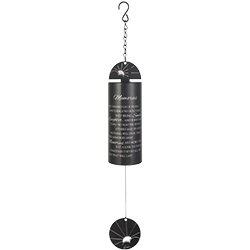 Memory Bells Cylinder Sonnets NEW! New! 22" Memory Cylinder Sonnet Bells. " They remind us of people and things we hold dear, they bring smiles, laughter and sometimes tears, No matter what others may do or say, nothing will take these memories away. Memories are more than a link to the past, Sometimes they're all that we have that will last." Online ordering is for shipping to a familys home . Please let us know in the NOTES section on the check out page, how you would like your card to read. For instance, With Deepest sympathy on the loss of your brother. His memory will live on. Love, the Jones Family For local delivery to a funeral home in our delivery area. You will need to purchase a stand . At no extra charge, we include seasonal faux flowers and a bow. call 724-861-8180 or text 412-759-9776. Deep rich church bell sounding tone. 22" Cylinder Sonnet. "With tears of sorrow we cry each day, in angels arms you were carried away." Please let us know in the "NOTES" section at checkout how you would like your card to read. For instance, in memory of Mary, she was taken away in angels arms, Love, The Smith Family. Online ordering is for shipping to a family's home. 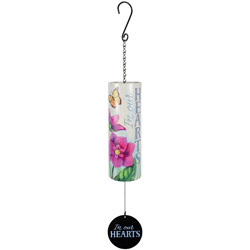 For local delivery to a funeral home in our delivery area, you will need to purchase a stand $20 which comes with complimentary flowers and a bow. Please call our store 724-861-8180 or text 412-759-9776. Deep rich church bell sounding tone. 36" Cylinder Sonnet. "In Our Hearts" "Those who touch our lives stay in our hearts forever." Please let us know in the "NOTES" section at checkout how you would like your card to read. With deepest sympathy, Love, The Smith Family. Online ordering is for shipping to a family's home. For local delivery to a funeral home in our delivery area, you will need to purchase a stand $20 which comes with complimentary flowers and a bow. Please call our store 724-861-8180 or text 412-759-9776. Deep rich church bell sounding tone. 36" Cylinder Sonnet. 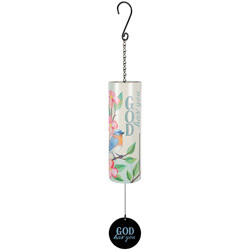 "God Has You" Please let us know in the "NOTES" section at checkout how you would like your card to read. With deepest sympathy, Love, The Smith Family. Online ordering is for shipping to a family's home. For local delivery to a funeral home in our delivery area, you will need to purchase a stand $20 which comes with complimentary flowers and a bow. Please call our store 724-861-8180 or text 412-759-9776. For local delivery to a funeral home in our delivery area. You will need to purchase a stand . At no extra charge, we include seasonal faux flowers and a bow. call 724-861-8180 or text 412-759-9776.